GOODYEAR, Ariz. – Reds catcher Brayan Pena walked into the hospital room, put his hand on Aroldis Chapman’s shoulder and spoke to him in Spanish. "I’m Brayan Pena," he said. 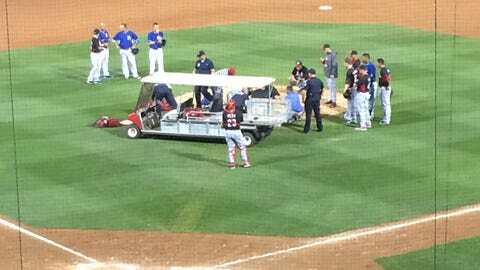 This was early Thursday morning, less than 12 hours after Chapman was struck in the face by a line drive off the bat of the Royals’ Salvador Perez during a Cactus League game. Pena said Chapman started crying. "I broke down, too, like a little kid," Pena said. The teammates were relieved to see each other, relieved that Chapman could communicate, relieved that the gifted left-handed closer was not injured worse. Chapman, 26, was scheduled to undergo facial surgery Thursday to repair a fracture above his left eye. He will miss a minimum of six to eight weeks. But Timothy Kremchek, the Reds’ medical director, said the left-hander "absolutely" will pitch again this season. Pena, who like Chapman is from Cuba, is in his first season with the Reds. He said he second-guessed himself for calling for a fastball to Perez instead of a slider. But Chapman joked that he just should have thrown his 99-mph pitch slower. Chapman told other jokes, too, Pena said — off-color "Cuban jokes" that demonstrated his memory was intact. In more serious moments, Pena said Chapman grew emotional when he learned that the rest of the game had been canceled due to his injury. And he instructed Pena to relay his appreciation for all of the support that he had been given, particularly to the Royals. Pena, who played for the Royals from 2009-12, visited the hospital Wednesday night with Perez, his former teammate and fellow catcher. He also exchanged texts throughout the night with a number of other Royals, including first baseman Eric Hosmer, who Pena said had tears in his eyes as Chapman lay still on the ground after getting hit. Just last season, Hosmer hit a line drive off the head of the Rays’ Alex Cobb, causing the right-hander to miss two months. But he wasn’t the only Royals player who was upset. Pena said he also texted with designated hitter Billy Butler, third baseman Mike Moustakas and of course Perez. Players from both teams visited Chapman in the hospital after the game was cancelled. Reds left fielder Jay Bruce and first baseman Joey Votto arrived together. Second baseman Brandon Phillips followed. Reliever Alfredo Simon also visited, as did others. Bruce said he left the hospital feeling much better about Chapman than when he arrived. "Absolutely," Bruce said. "When I got there, you just don’t know. You just don’t have any idea what’s going on. To get there and see him, he was in much better shape than visually I thought he would have been in." "Yes, he did," Bruce said. "He was responsive. He never lost consciousness. It was refreshing to get there and kind of see that he was still coherent. He knew what was going on." Relief. The word describes what Chapman offers as a pitcher. And on the morning after, it perfectly described the mood at Reds camp.